“what the hell is this planet called?” crackled the comms. Hammer smiled, not having a clue, just amused by the fact that no-one else did. It had been a long campaign so far. This was reported to be the last bastion of Black Scorpion resistance. The precious three had gone without a hitch, and morale was high, even if the Crusaders were struggling without their beloved jump jets. “why the hell are we in these damn mechs?”, came the voice of Aoshi, irritation clear even with the poor comm quality. “we don’t have much choice, the blasted gravity is too screwed to allow us to take jump jets, so we’re stuck here. Now quit whining, and get moving, before we take another leg.” was the amused reply of Xavier, Commander-in-Chief of the Free Will Crusaders. There followed amused chuckles from the assembled warriors, and the usual background whining from Deathly. “ok people, we’re approaching the Departure Zone, everyone buckle up and get on the scanners,” came the abrupt orders from Xavier. An annoyed grunt was the only response as the Crusaders reached the DZ and gathered together. It was quite a sight, five large battlemechs, all in mottled green camouflage. Lieutenant Aoshi, in the lightest ‘mech, and even that was a huge, 70 ton Nova Cat captured during the last campaign. His wingman, Lieutenant Deathlyeyes, had still not returned from hunting down an enemy harasser, and the decision was made to continue without him. The power in the force came from Commander Xavier and Sergeant Alex Zero, both running in laser filled Sunders. Filling out the invasion force was Sergeants Hammer and Iceman, both plodding along in Cyclopes. keep going hammer that sounds awesome. Deciding that discretion was the better part of valour, Hammer decided that it would be wise to use the mountain as cover, and started to move into position. Just as he was approaching the cover, there was a flash as several PPC bolts flashed past, searing the paint on his mech. Quickly he slid down the side, using the large mountain as protection as he quickly checked the satellite imagery to detect where the enemy was. The reply took a few seconds, “all units, turn round and return to the DZ, we’re gonna have to swing wide around. They managed to reach the position we wanted.” Xavier sounded quite excited. Following several affirmative calls on the comms, the entire star turned and moved back the way they had come. No other fire was spotted on the return journey. Hammer’s comm system beeped, signifying an incoming transmission from the dropship Freedom. Hammer keyed his accept button, and watched as the probable deployment area for the Black Scorpions was highlighted on his satellite image. He was already viewing the intervening terrain when the order came through from Xavier to change targets to nav point delta, approximately half-way to the Scorpions DZ. The first thing that went through Hammer’s mind as he looked at the route was a prayer that the mechanics had properly sealed all the mech joints as they were due to go through moderately deep water. Scanning left and right, Hammer finally followed the rest of the Crusaders into the lake, his fingers becoming slightly sweaty on the control stick. About 2 minutes later, his feet became very sweaty, and Hammer got slightly confused and looked down. “Hammer, quit screwing around on the comm channel, before I give you an even bigger hole to worry about!” came the somewhat annoyed response from Xavier. Finally dragging his dripping ‘mech from the water, Hammer started moving towards the large hill ahead, intent on getting into cover as quickly as possible. The rest of the star was already over by the time Hammer found his first problem. The air inside the cockpit turned a strong shade of blue as the feet of the cyclops were unable to clear the steep side of the hill. It took a good 30 seconds for Hammer to manoeuvre to a more suitable slope when suddenly, the entire mech shuddered once and powered down, red warning lights blinking throughout the cockpit. It took a good two minutes to fix the damaged mech once Hammer had realised that the earlier leak had got into the electronics and flooded them. Once back online, he continued up and over the slope…. As Hammer crested the rise, he took the time to look at all the hills around him. The rest of the star were some distance in front, barely visible in the morning haze. The lack of radar preventing them realising he was so far behind, and his own pride preventing him from informing them. He frowned as he realised that the area ahead was a perfect ambush point, but with his star already most of the way across the valley ahead, it was unlikely that the enemy were waiting for him to come out in the open. He pushed the throttle forward to the max, the cyclop’s feet slipping slightly as he raced down the hill into the valley itself. This was replied to various people as the area around the rest of the Crusaders lit up with laser, PPC, gauss, and missile fire. The commands and information flying through the comms without much chance to respond properly. Realising he was trapped in the valley, with almost a kilometre of open terrain ahead of him, Hammer turned a full 180, and turned back, just as another salvo of missiles came flying his way. He threw the throttle full forward, receiving a worrying cracking sound from the control as he offered a prayer to anyone who could help him get back behind the hill before the missiles reduced him, and his cyclops, to their component parts. His prayer was answered, as only one missile hit him, the hill and his LAMS managing to prevent an untimely disaster. Trapped behind the hill, a missile boat clearly paying an unhealthy amount of attention to him, Hammer cringed as he started hearing damage reports coming over the comms. His own damage was remarkably light, his evasive tactics managing to keep up with the volume of fire he’d received. After thirty seconds, and realising he couldn’t stay here all day while his friends were massacred, Hammer decided to do something…. Hammer slowly crept up the side of the hill, his hand hovering over the reverse throttle, his eyes scanning between the hill ahead and his controls. His heartbeat racing, the cockpit cleared the hill, and ahead he was presented with a Black Lanner, in profile, at 800 metres. He stepped up a little further, ensuring that his weapons would clear the hill if he fired. He stood there, in full view, waiting for the Lanner to present the main part of its torso to him. After what seemed like an eternity, a smile spread across Hammer’s face as he switched throttle to full reverse, and pulled the trigger on the control stick. As he dropped out of view, he was rewarded with the sight of the Black Lanner lying face-down on the hillside, still glowing from the residue of the PPCs that he’d hammered into it’s torso. Realising the opportunity, he quickly throttled up, clearing the hill again, and just as the Lanner had regained it’s feet and turned to see where it was getting hit from, Hammer opened up with another full alpha, claiming a large chunk of the Lanner’s armour as it was sheared from it’s torso. Hammer rapidly descended out of sight, just in time, as the friendly female voice warned him about a slight heat problem, a few seconds before the entire Cyclops shut down. Not wishing to waste coolant while in relative safety, Hammer sat and listened to the news washing across the comms. Xavier had taken a fearful pounding trying to get into a flanking position, and Alex Zero and Iceman were being pinned down. Aoshi was returning fire well, but with the rest of the star frozen, appeared to be struggling. The Cyclops finally recovered from the abuse Hammer had given it, and it’s systems came back online. Hammer decided that his life was of less consequence than that of his comrades, and decided on an entirely stupid, yet courageous tactic, that would later be known as the ‘Hammerhead Manoeuvre’. Pushing the throttle to the max, Hammer raced over the ridge, and waited until hitting the flat before centering his targeting reticle on the Black Lanner, who had now been positively identified as Rattled, a member of the Black Scorpions who possessed a similar position to Hammer, that of scout and general harasser. Hammer cleared the 500m range, and a small light came up, saying that all weapons were now in range, at which point Hammer depressed the main trigger, launching a veritable swarm of weapons at the his target. Realising he was in the open, and was likely to receive fire from the entire Black Scorpion Defence Force, Hammer ran into the trees that barely came up to his cockpit. He hit the emergency stop, the Cyclops threatening to topple forward, as the legs stopped and stabilisers kicked in to prevent overbalance. As soon as was safe, Hammer lowered his ‘mech into a crouch, hiding in the trees, for all the good it would do. The seconds passed, and no beams of light reached out to touch him. He stood again, realising that three of the defenders were on the ridge side, looking at him. He decided the safest course was to continue his mad dash towards them, and hiding below the hill they were perched on, to prevent their seeing him. After ten seconds, half a ton of sweat, about 4000 heartbeats, and a few hundred prayers, Hammer reached the relative safety as the missiles that had been launched at him all tried to go through the hillside. Now all he had to do is work out how he was going to get out of this mess he’d gotten himself into…. There followed a loud explosion as the Sunder’s reactor went critical, leaving a large crater in the middle of the valley. Hammer tried to work out why he was in the middle when the comm system chirped at him again, “Hammer, what the hell are you doing? Oh my god, you lunatic!” It was clearly Aoshi, nursing his damaged Nova Cat, the right arm dangling uselessly at it’s side. He continued down the other side, as the Black Scorpions threw some defence at him, consisting of Rattled in his heavily damaged Black Lanner, and also Lasher, in an undamaged Fenris. The Fenris had been waiting for it’s moment, it’s weapon selection based on the likelihood that there would be short range weapons fire. Hammer instinctively threw the controls into a hard right turn as he brought his reticle to bear on the more dangerous Fenris, setting his LAMS onto automatic as he did so, in order to attenuate the damage from the missile-based Black Lanner. It was surprising that anyone could see anything with the amount of debris thrown up by the three mechs, brawling at ranges of 50 metres. There was a flash of light as a laser seared the area just around the cockpit, the specially designed systems preventing him from roasting, but still not completely attenuating the heat as Hammer sweated freely, his jumpsuit now almost totally drenched through. Rocked by a sudden LBX shot, Hammers careful aim was thrown wild, and he ended up firing low, tearing a leg from the Fenris, who struggled to stay upright. Hammer could not react quickly enough to the change in speed of the Fenris, and rammed it at a combined speed of about 100kph. This was enough to knock the Fenris over, and Hammer capitalised by hitting the reverse throttle, and gaining some distance, preparing for the killing blow against the smaller mech. Just as his reticle turned red over the last remain Fenris leg, the Black Lanner achieved lock-on, and fired a full salvo at Hammer, who was knocked off his shot. Turning back to the Lanner, Hammer selected the full alpha option on his control stick, and brought his reticle onto the cockpit area of the Lanner. Desperate to avoid a painful ejection, Hammer depressed the trigger, shouting a curse at the Lanner as his PPCs, gauss, and missiles all found their target. There was no way that Coolant could survive such a horrific assault on his already crippled ‘mech, and he was forced to punch the ejection button as his reactor went into overload. The force of the blast caused catastrophic damage to the now standing Fenris, which also went into overload, forcing another ejection. Hammer, caught in the blast of both Scorpion ‘mechs, was flooded with waves of heat that his damaged Cyclops couldn’t begin to cope with, and he had to hit the shutdown button in order to avoid the same fate. His last view as the viewscreens went black was that of a Marauder, and the newer Marauder II standing only 300 metres ahead of him, while he was powered down in the open. haha thats crazy how we know the ending but its still intense!!! dude hammer you should be a writer this is seriously intense i mean i have not been this engrossed in a story since like i was a kid reading the Mechwarrior books. The Marauder then turned it’s attention to the Cyclops nearby, that it had just spotted. Hammer could imagine what was going through the mind of his target, Deathrow, as he was experiencing a similar rush of adrenaline to combat the fear that was growing. He pounded the firing button, and his trusty Cyclops launched a devastating array of weaponry at a range that can only be considered ‘point blank’. Deathrow must have been only a fraction of a second behind him, as when Hammer’s barrage connected with the centre of the Marauder, a veritable light show of energy beams erupted from his target weapons. Fortunately, the impact from Hammer’s assault had knocked the Marauder off target, and all the energy beams fired deep into the hillside, incinerating a family of moles. Deathrow did not have the chance to curse at Hammer, as his Marauder was rapidly going into overload, and he was forced to hit the ejection button. Hammer watched as the ejection pod raced over the mountain, and whispered a prayer to the gods that Deathrow would survive the, somewhat dangerous, return to the planet. By this time, the Marauder, piloted by BomberHazen, was realising that there was an immediate threat in the vicinity. He started scanning left and right, and finally spotted Hammer as the Cyclops disappeared behind the ridge. Just that quickly, a previously unseen mech launched a pair of heavy Thunderbolt Missiles, both of which locked onto the unfortunate Iceman, who was forced to eject. This foresight was quite fortunate, as the Cyclops he was piloting was suddenly missing a head as it dropped to the ground, limp. 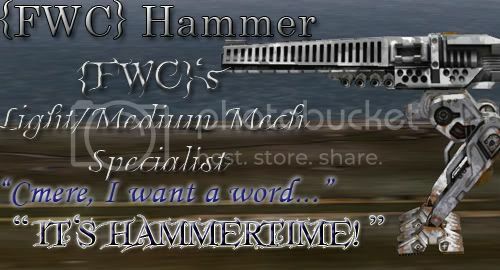 Feeling all alone, Hammer hugged the hillside as he tried to work out the best way to continue the assault…..
“Why not? Everyone else does, just as they pull the trigger !” came the chuckling voice of Hammer, finally having turned round to face the Marauder. He pulled the trigger for his alpha strike, praying to put the large target on the ground. All the shots landed on target, and Hammer was rewarded with a blastwave of heat and energy as the Marauder could no longer function and exploded, it’s engines critically damaged. Hammer watched the ejection pod fly high into the sky, remembering when it had been him in the same position, praying that the enemy were honourable enough to avoid shooting at the pods. About half a minute later, Hammer had finally got the overheated Cyclops back on it’s feet, and with Aoshi just behind him, went off in search of the Thunderbolt toting Archer, a prospect that filled Hammer with trepidation. They crested the rise, and were surprised to see a Hollander II staring at them. It launched a heavy gauss slug, and Hammer grimaced as the Cyclops took in in the left torso, a hole punched clear through the mech, but without hitting any internal systems. Hammer centred his reticle on the wildly veering ‘mech, but was unable to hit due to it’s evasive manoeuvres. Calling a warning over the comm channel, Hammer switched to his streak missiles, glad he had brought them along, as he waited for the potent salvo to load up. Aoshi crested just as the missiles were ready, and the two of them locked on to von Pilsner, who was throwing his Hollander into wild turns to avoid fire while his gauss rifle reloaded. It was not enough, as Aoshi poured direct lasers into the smaller mech at the same time that Hammer’s guided missiles pounded the Hollander. The result was impressive. Von Pilsner lost control, the Hollander falling and sliding down the side of the hill at high speed. It came to rest near the bottom, still in full sight of the two remaining Crusaders. Hammer switched back to full alpha, and fired all his remaining weapons at the prone ‘mech. It was more than enough, the armour of the Hollander tore apart, just before the ejection pod launched at a dangerously low angle. Hammer made a note on his satellite map for retrieval, as the two of them looked around for the Archer, now positively identified as Spectre. Hammer’s response was a deep laugh, and was matched in that by Aoshi, as they continued their search…. lol hurray im still alive! And now, the exciting conclusion to FWCN's serial drama, "Lock and Load"
Hammer looked around the ridgeline lazily as he approached it, pressing the comms signal, "what's the chance that this guy is even anywhere nearby any more? If I were him, I’d have hot-footed it back to the dropship as quickly as i could if i were in his position." "Fair point, do we know where the dropship is? This could take forever without knowing which way he's gone," came Aoshi's considered response. "hmm, good idea, I’ll contact the command vessel, and see if they have a bearing on it." Hammer typed his request into the console and uploaded the narrow-band transmission to the dropship Freedom. Just a few seconds later, he keyed the comms button again, "looks like we need to turn to a bearing of one-seven-four, Freedom has located a strong series of transmissions in that direction a few minutes ago. No idea on direction, the atmosphere is causing too much interference." "roger that, switching to bearing one-seven-four." Aoshi was starting to sound bored as he wheeled around the large hill-base. Hammer, already approaching the ridge of the hills, decided to climb to the top, and go straight over. If nothing else, that would at least tell him if the archer was within range. He stopped on top of the hill, looking directly into the centre of the Archer, only 200 metres away, about three quarters of the missile-toting bad guy stuck behind the ridge. Archer and Cyclops stood there, looking each other in the face, surprise on both pilot's faces. "contact, contact, contact. Just the other side of the hill, Aoshi. Engaging now." Hammer was on the verge of panic, as he realised that Spectre must have been close to locking on in the short range. He did not want to be on the receiving end of the dual-thunderbolts. His reticle went red as it crossed the front of the Archer, and Hammer depressed the trigger, launching all his weapons in an attempt to throw the enemy 'mech off target. As they connected with the stationary 'mech, he pushed the throttle control forward, and starting running / sliding down the hillside, determined to prevent the smaller 'mech escaping into the mountains. He was rewarded as he went over the final side of the hill, and realising the danger, threw his mech to the side, the servos whining in protest, just as the missiles launched from the Archer. Fortunately, they went wide of the mark, courtesy of Hammer's instinctive evasion. Realising that they had been dumb-fired, Hammer started to turn his mech as fast as possible, launching yet another devastating assault on the enemy. 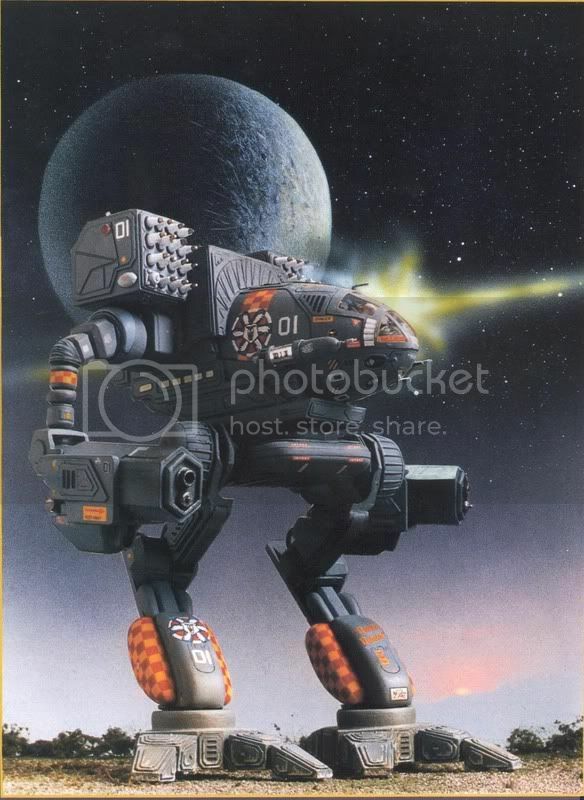 His mech glowing from PPC fire and riddled with Gauss holes, Spectre managed to achieve lock-on, and launched his deadly projectiles at Hammer's slow-moving assault mech. Hammer heard his warning siren, and threw his torso to the side, managing to prevent the missiles from hitting him in the centre. One of them glanced his left arm, forcing all his returning fire to go awry, while the other one connected solidly in the left side of his torso. Hammer slid on the wrecked side of the hill, his Cyclops losing all balance and falling on it's side as the Archer triumphantly stopped and centred on his torso, waiting for the thunderbolt launchers to reload and allow him the killing shot. Spectre was just hovering over his trigger as Aoshi's damaged Nova Cat strode over the side of the hill, launching his deadly lasers into the side of the Archer, destroying one launcher and jamming the other. Hammer, at this point, managed to get to his feet, turned to the Archer, and fired his final shots straight into the servo drivers in the groin of the damaged Scorpion. There was a whoosh, as the ejection pod launched out, just as Hammer managed to press his Long-range comms. "this is Delta-Xray-Hammer to Dropship Freedom. The area is clear. We have 3 secure ejections, and two extremely damaged mechs here. Get me a salvage crew and a mobile field base here within the hour. Hammer out." Hammer then switched to the guard channel, " Aoshi, you're in command. Look after the place until i get back." Aoshi's response was unsurprising, "What the? You going somewhere Hammer? Hammer?" The salvage crews arrived, and it took some time to open Hammer's cockpit, where they found him unconscious. It took medics fourteen hours to finally bring him around. And Aoshi was the first one to greet him, finding out that Hammer had passed out from adrenaline shock. Ok, for those who didn't know, this is actually based on a match against the Black Scorpions for Planetary League. Although a few minor details were changed, 90% of it remains true to the actual match.